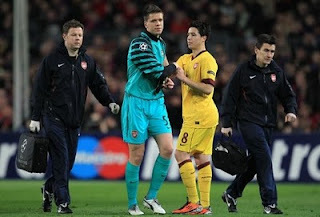 Wojeciech Szczesny will be out "for a while" according to Arsenal boss Arsene Wenger. Cesc Fabregas will miss the next two games and Alex Song is also out of the trip to Old Trafford on Saturday. "He will be out maybe for the next two games. He is very disappointed because it is becoming a bit of a problem for him, but it is very superficial." However striker Robin van Persie will be fit to make the trip to Manchester this weekend. Reserve goalkeeper has been recalled from his loan to League One side Southampton and will be on the bench on Saturday. Manuel Almunia will start the FA Cup tie. Theo Walcott will also miss the game.